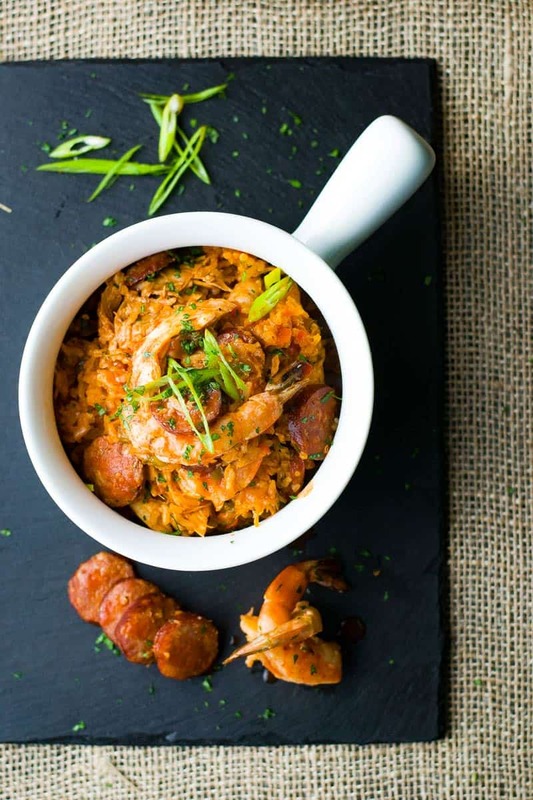 At the crossroads of Spanish and West African delicacies, Creole Jambalaya is a dish from the heart and soul of New Orleans. With the blending of French, Spanish and African culture, New Orleans is my favorite city in the world, with Paris a very close second. Every Creole dish has ties to one of those cultures, but the city has claimed it as its very own. 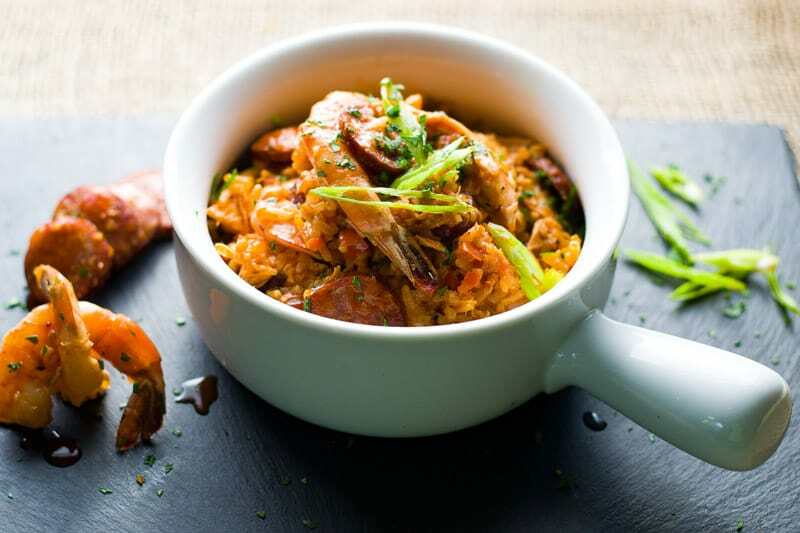 Creole Jambalaya evolved from Spanish Paella, but without the saffron and jollof rice from West Africa. Instead, cheaper tomatoes substitute for saffron making a “red” jambalaya vs the cajun version that sans tomatoes. And from a chef’s perspective, Creole Jamabalya is a joy to make. Eddie appreciates that the dish requires flavor layering, as each ingredient is cooked and blended into the next. This isn’t a slow cooker meal, with everything tossed in together at once. Jambalaya requires soul, love and patience. And the heat, the delectable, tantalizing heat that’s hurts so good. That’s the African influence coming through with cayenne and extra shakes from a Tabasco bottle. Ask 10 locals what proteins you should add to Jambalaya and you’ll get 10 different answers. We overloaded ours with three – shrimp, andouille sausage, and chicken, but you can add any kind, even duck. Authentic "red" Creole Jambalaya with chicken, sausage, and shrimp. Using a medium-sized pot add four cups of water, one tbs. 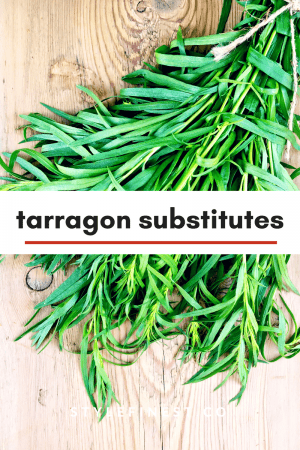 salt, two bay leaves, and one lb. chicken breast cook on medium high for 10 minutes, shut off heat and let sit in water for another 10 minutes. Remove chicken breast and set aside. Next, wash and cook one cup long grain rice using 1 1/2 cups chicken broth, two tbs. corn oil (or one tbs. bacon fat) and one tbs. kosher salt. Cook until rice is done. About 16 minutes. Keep covered to retain heat. Using a large skillet or saute pan over medium heat add butter, yellow onions, celery, both red and green peppers, 1 bay leaf and garlic. Sweat your vegetables until soft and slightly caramelized. About four minutes. Add sliced andouille sausage and continue to cook for five minutes stirring every minute so not to burn vegetables. Reduce heat to low. To skillet or saute pan add two teaspoons garlic powder, onion powder, white pepper, and paprika stir. Add one teaspoon dried thyme, dried oregano and cayenne pepper, stir. Shut off heat. Fold in one diced Roma tomato, Worcestershire sauce, hot sauce and tomato paste. Set aside. Take your chicken breast and pull meat (shred) and add to skillet. Peel and devein shrimp and add to skillet. While rice is still hot add it to skillet, fold altogether. Cover with foil and allow shrimp to cook about eight minutes. After eight minutes drizzle about one tbs. corn oil, fold all until completely incorporated. Add chopped scallions to garnish. Definitely going to make this for my husband and I for datenight one day! We both love spicy foods like this and this looks delicious! I have never had Jambalaya and it sound amazing, lots of rich good ingredients. I’ll definitely have to see if I can whip this up. This is my kind of food! I want to reach through the screen and grab the bowl, a big spoon, and start eating this right now! Yum!! Thanks for this educating us about this delicious dish!! It really does perfectly represent the beautiful culture mix of New Orleans!! You’re so welcome. 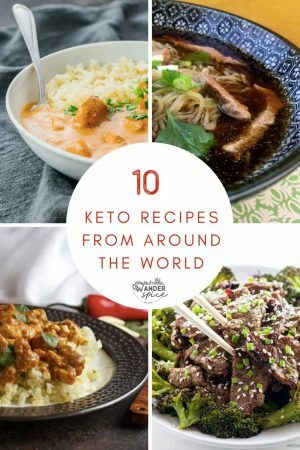 We’re a bit of food history geeks over here and love the stories behind some of our favorite dishes. Oh mama!! This looks so good. I spent a week in NOLA years ago and love to recreated our favorite meals at home! I have to try this one! Nothing can beat an authentic recipe. I can smell the flavors from here. I should get all the ingredients needed and make some for our family! That’s really amazing! I love New Orleans for all of their flavors and recipes as well. The food is really good there, aside from the music and the culture! I would love to try this recipe. This looks so tasty. I love your bowl I have that same one I bought from world market years ago and still love it. Now I can make this soup in it! We got ours from Crate and Barrel and it’s the perfect size. My husband would love this. It looks perfectly spicy and something I would enjoy too. I have had some jambalaya before but this looks so amazing. I am going to have to give this a shot! Wow, that looks amazing! 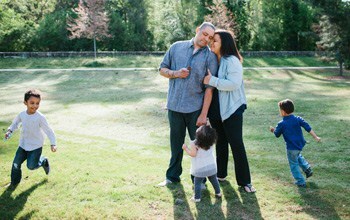 I’ll definitely have to fix something like this for my family. They would love it! Yum! It looks really delicious. 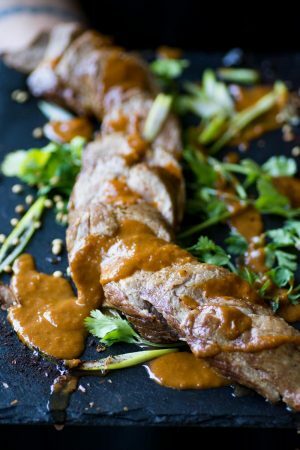 Has lots of ingredients which sometimes throws me off but I’d love to give this a good try! I love any food from Louisiana especially Jambalaya and Gumbo! I grew up eating cajun food and my favorite place to visit is New Orleans. This makes me want to go now! 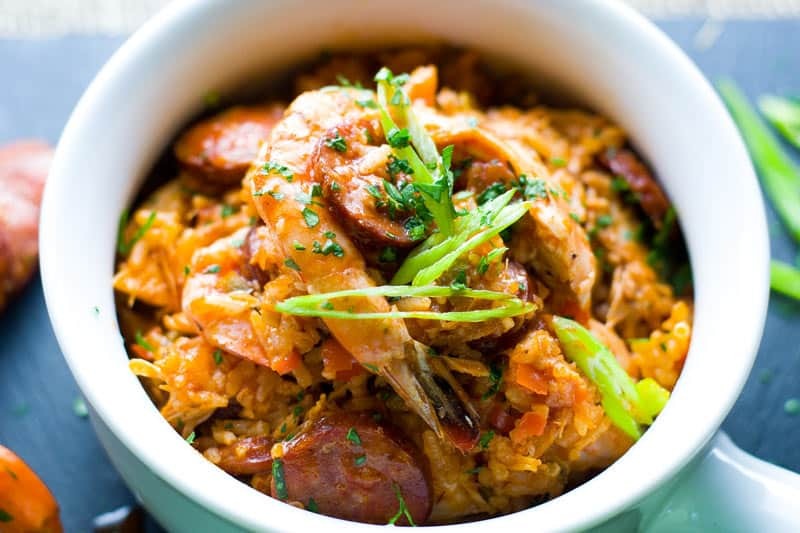 I’ve never made jambalaya before, but this looks and sounds delicious! I would definitely try making this sometime. This looks delicious! My brother and sister-in-law lived in Louisiana while he was stationed there for the ARMY. They came back loving jambalaya and she just shared that she won a new pot so she can make her own. I’ll have to share this recipe with her!